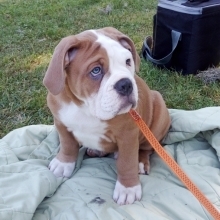 The Olde English Bulldogge is often confused with the English Bulldog, but there are some key differences between the breeds. Most noticeably, the OEB is much taller than a standard English Bulldog, has a narrower head, and has a more athletic look. This breed is friendly, affectionate and adaptable. Olde English Bulldogges make great family pets.